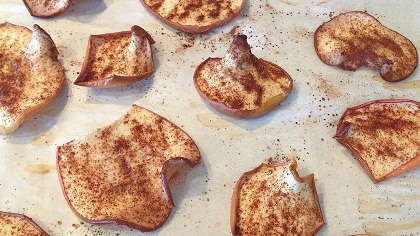 Maple cinnamon apple chips make a great snack and are a healthy option. Maple Cinnamon Apple Chips are sweetened with natural ingredients and baked to a crispy crunch. Using a veggie mandolin or very sharp knife, slice apples thinly to form chips. Spread on parchment paper on cookie sheet in a single layer. Brush each apple slice with maple syrup. Lightly sprinkle each apple chip with cinnamon sweetened with Stevia powder (to taste). Sprinkle chips very lightly with salt. Bake at 300 degrees for 50-55 minutes until apple chips are browned. Remove from oven and allow them to cool and crisp up. Apple chips are great for dessert, lunches, and after school snacks.